Join our romance tours to find your lifetime Filipina bride and exchange vows with her! 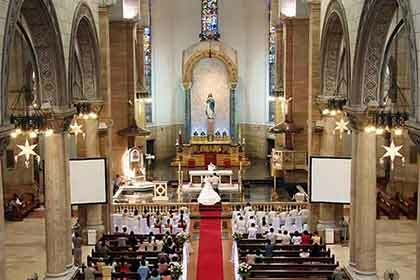 Marriage is one of the significant sacraments in the Catholic faith, which is practiced by most Filipinos. To get married is a dream come true for every Filipino woman --- to walk down the aisle wearing a fantastic white gown, and to vow with her partner before God, and her loved ones as witnesses. Marrying is fulfillment of a Filipina's lifetime dream. Varying from culture to culture, the Philippine culture and traditions in marriage are distinctly derived from their belief, values, and customs. During early times, a tribal priest or priestess would preside over marriages. The rite usually took place in the home of the tribal priest or priestess. The bride and groom's necks and hands being bound by a cord, or with long strands of hair entwined together. This affirmed the effectiveness and solemnity of their marriage. Up to this day, marriage in the Philippines starts off by formally asking the parents of the woman for her hand. The parents' approved consent symbolizes unity of two families and acceptance by both sides. Marriage, in the perspective of Filipinos, is not only a union of the couple, but the coming together of two families as a community. It is establishing rapport for both sides and the beginning of a new branch in their extensive network of a family tree. 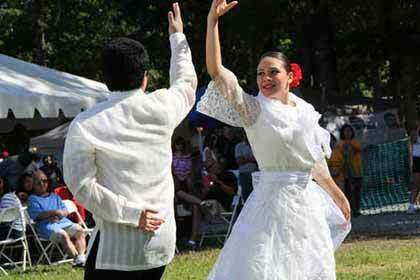 Filipino marriages are meaningful and symbolic. The attire used by the groom and bride plays a significant role and are usually traditional or national outfits. Furthermore, ritual objects are also used until today, such as the "unity candle" which represents the joining of two families and the spiritual presence in the couple's life. The Philippines is one of the last major countries that prohibits divorce by law. It pays due respect to the teachings of the Catholic Church, which holds a big influence on the Filipino people. Marriage represents commitment of the couple and being one with God. The things they used to do separately are now combined. They now share everything in life like dwelling, necessities, and routines. Their union is expected to grow as they build trust, happiness, family, and every little thing in life. 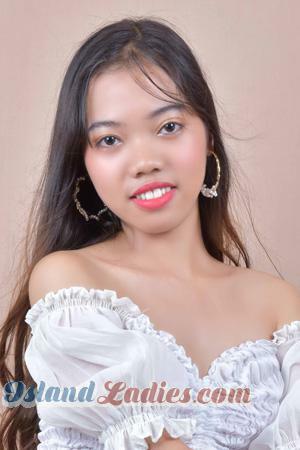 Register on our site for free and find out more reasons why Filipino women are ideal wives. Philippine women place high regard on the importance of every family. In fact, the country doesn’t allow divorce. Annulment is available, but the process is difficult, time-consuming, and expensive. Bearing this in mind, Filipinos are careful in making their decision to settle down. They fully prepare themselves for the responsibilities it entails. Filipino women are brought up with this mentality; they view marriage as a decision they will only commit themselves to only once in a lifetime. She keeps committed to her husband and kids. You can trust that she will stay for you and the kids through thick and thin. She is a natural caregiver. There are a number of Filipino women working abroad as nurses or caregivers. They are known in the world to give one of the best services in the industry. The secret is they do not only see it as a job; they put compassion and heart in all that they do --- no matter what field they are in. Filipinos take good care of the elderly and children. Especially to their parents, since they’re grateful for looking after them when they were kids and they make it up to them by returning the favor as adults. It’s common Filipino mentality for children to “give back” to their parents or family as their obligation. Filipinas are very considerate and thoughtful. They always want what's best for you and they will always prioritize your welfare, as part of her family. She is not difficult to please. Your potential Filipino bride is raised from a humble family. She has learned to appreciate every little thing in life. As a girlfriend, a simple dinner and a night stroll with meaningful conversation makes a perfect date for her. There are some other ways to win her heart on a date by learning the dating culture in the Philippines. Filipinas are appreciative. You don't need to give her a garden when only one kind of flower brings a smile on her face. Any little act of thoughtfulness will always touch her in a very special way. She sees your worth beyond your physical appearance, age, and economic capacity. For Filipinas, age doesn't matter and they take this literally in marriage and romantic relationships. As long as the man is genuine in his intentions and the relationship has open communication, she believes it will work out. She knows that a relationship is beyond one's physical appearance and age. For men of age, there are many reasons why you should be marrying younger Filipino women. Majority of Filipinas are Catholic. Their religious beliefs and principles guide them to be a devoted Christian, a faithful wife, and a law-abiding citizen. They put God at the center of their lives. In every step that they take, they strive to be morally upright. More importantly, with God in the middle of your relationship, your marriage will surely last for a lifetime. Sign up on our website today and take part in our singles' tours. Find your bride among the many beautiful Philippine women seeking marriage. Take the single step towards your lifetime happiness! Register for free now!